NSI is pleased to introduce our next generation Intelligent Electric Tamp system, the LabelBot Tamp. When an opportunity for Nautilus Systems, Inc. came along to develop our next generation of print-apply systems, the LC100 Applicator Series, we wanted to take our technology to the next level in all possible ways. Regarding the tamping system our primary goals were to build a groundbreaking device that is fast, versatile, and intelligent. We would implement a device that included self-teach functions. We would minimize opportunities for confusion and improper setup. We would have a system that could provide a simple tamping operation like previous generation tamps but with options to provide significantly more sophisticated motions for approaching a target and performing placement operations. We would design a modular system with capacity to grow and enhance its features and functions. Pneumatic tamping systems, though functional and useful in previous generations of equipment, include many weaknesses. They require clean, dry, compressed air which is inefficient and costly. They can be noisy. They are difficult to control in terms of motion profiles. When adjustability is included in them, the adjustments can be difficult and confusing. Our previous electric tamping solutions, though functional and providing easier adjustment, were also limited by use of turnkey electric actuators that were designed as a ‘one size fits all’ solution. Our assessment determined that no turnkey electric actuators, even with modifications, could offer the features and functions to meet the objectives for our new tamping system. After significant research and development we selected, engineered, implemented and integrated various components to develop a system that harnesses advances in all relevant technologies including processing power, sensor technology, communication networks, and programming techniques which will allow us to modularize and add as we move forward. We are pleased to introduce our new intelligent electric tamp system, the LabelBot, for our LC100i Applicator products. This tamping system will change label placement as it has been known for decades. The LabelBot Intelligent Electric Tamping System will be the best tamp system ever used for automated label placement operations. Stay tuned for future developments and eventual implementation of this tamping unit to our PL Applicator products. NSI is pleased to introduce our next generation of print and apply applicator systems, the LC100 series. ‘LC’ denotes ‘Label Composer’ as the user can design their label content with virtually any text, barcode, or image that can be printed using thermal transfer printing technology. ‘100’ denotes that this series is designed for labels up to 100 x 100mm in size. We are proud to be releasing the LC100i ‘print and apply’ Applicator series for the first time at Pack Expo 2018 from October 14 – 17, 2018 in Booth W-871 in the West Hall Pharma Pavilion at McCormick Place Convention Center in Chicago, IL. The LC100i, our next-gen print and apply system, is an advanced system that provides ‘on demand’ printing from a 600 dpi thermal transfer printer and our newest innovation, the LabelBot tamp. The LabelBot is an Intelligent Electric Tamping System. For simple setup and operation it can be used in a mode that simulates a pneumatic actuator but it can also be programmed to offer performance like that of a robot in terms of accel/decel profiles, placement force monitoring, and collision detection along with the ability to self-teach. 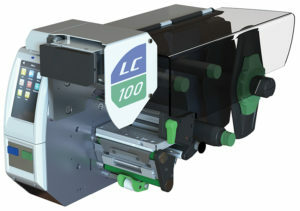 In addition to the LC100i Applicator we are also releasing the LC100r robot mode feeder ‘print and peel’ system. This system is configured so that the user can integrate it with their own robotics or pick and place system. Soon to be released is the LC100RT90 Applicator. This unit incorporates an electric tamp that provides a 90-degree rotation after the label is peeled, but before it is applied to a target. This system is specifically configured for applications that require this type of tamping motion. 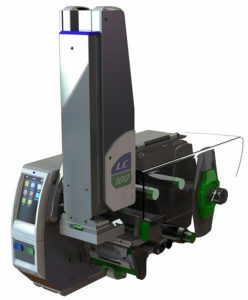 In addition to these three standard applicator configurations of our LC100 platform we have also planned new modules for the LC100i that will allow it to provide new functions including a ‘print-inspect-apply’ function in which a vision system or other reader can be integrated so that a printed label can be inspected immediately after printing but before application to a target. This innovation will ensure that a bad label is never applied to a product and includes options for automatically disposing of rejected labels. This is the first packaged system on the market that allows a user to inspect a printed Label before they apply it to a target. Nautilus Systems, Inc. (NSI) is a leader in automated systems for labeling, print and apply labeling, and precision placement of die-cut adhesive components such as films, foils, gaskets, adhesives, two-sided adhesives, and other roll fed components that are die-cut or laser cut. NSI has systems installed in more than 25 countries worldwide and throughout the USA meeting the demanding requirements of manufacturers, contract assemblers, and automation providers in healthcare, medical device, packaging, electronics assembly, consumer goods, automotive, aerospace, and virtually any other industry. All NSI Applicators include our patented ‘Capture-Peel-Place’ technology. This technology includes a retracting peel system which allows us to locate the component in the web feed axis while it is still attached to the web (liner), capture the component using vacuum while it is still attached to the web, peel the component from the web, and place the component onto the target with high accuracy and repeatability. The Capture-Peel-Place system can be used with virtually any component geometry including the ability to place multiple components in one application. In response to customer demand Nautilus Systems Inc has developed new Tube Pro options that result in a significant advancement in precision label wrapping operations. For Cylindrical Labware and Cylindrical Devices (Tubes, Vials, Syringes, Medical Devices, etc) our new Tube Pro option allows us to label significantly larger ?objects than was previously possible. 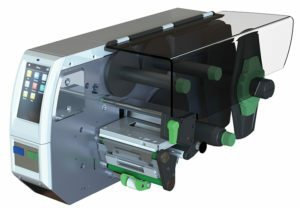 We are also able to provide radial alignment options by engaging the cylindrical device with a motorized drive, rotating it until a specified feature is located, and then rotating the device to a defined radial offset position to ensure that the label or die-cut adhesive component is applied in the correct radial position. This feature has been specifically requested by pharmaceutical and medical device manufacturers to ensure that product identification labels are applied to cylindrical devices with certain printed features of the label aligned perfectly to physical features of the device. For Non-Cylindrical Labware and Non-Cylindrical Devices (Tubes, Vials, Syringes, Medical Devices, etc) another new Tube Pro option provides an innovative method for labeling devices with odd shapes while ensuring that the label is well applied to all surfaces. This Tube Pro option incorporates multiple axes of servo and stepper motion to provide the necessary coordinated function and is available only through Nautilus Systems Inc. Because Non-Cylindrical device shapes can vary greatly Nautilus Systems Inc evaluates each application specifically to ensure that our standard solution applies and will identify any modifications or enhancements that are required for each application. Nautilus Systems Inc has successfully implemented both of these Tube Pro configurations for highly demanding pharmaceutical companies and will continue to perpetuate this solution for new applications. These Tube Pro devices can be combined with either our PR100 ‘print and apply’ systems or with our PL Applicator systems including our PL Applicators equipped with our Shuttle Chuck Tamp and in line inspection and auto-reject systems. For all of your precision label wrapping and die-cut adhesive wrapping applications please contact the world leader, Nautilus Systems Inc . The Shuttle Chuck uses a servo motor and cam to provide a precision horizontal motion of the chuck between the pickup and placement positions. The Shuttle Chuck stroke is 100mm. When the Shuttle Chuck is at the retracted position it is ready to pickup die-cuts from the liner and/or place the die-cut part on the reject platen. When at the extended position the Shuttle Chuck is ready to apply a die-cut part on the target substrate. While a part is being applied the Shuttle Chuck does not interfere with operation of the PL peel bar which allows the next die-cut part to be fed into precison pickup location concurrent to die-cut placement. Also, when at the extended position the Shuttle Chuck allows a camera inspection system to be used to inspect the next die-cut part from above. Inspections may include printed feature content, location, or quality or other physical aspects of the die-cut parts that can be measured using an inspection camera. Each application of cameras and vision systems can be customized and engineered based on the requirements of the application by Nautilus or by our customers. This allows each die-cut part to be inspected ‘on demand’ and with a clean and easy method of rejection when necessary. When the Shuttle Chuck extends 100mm to the application position it creates an opportunity in some applications to minimize the tamp stroke required for application because the die-cut part is moved forward 100mm with the Shuttle Chuck. Dependent on the physical configuration of customer automation and tooling this configuration may make it possible to operate the applicator with minimal tamp stroke and corresponding reduction in cycle time.? For more info please contact Nautilus Systems, Inc.
Orlando, FL in January 2013 and has met great initial success. For our customers who require even more automation, particularly for applications that require labeled vials to be placed into standard (SBS) trays or custom racks, we have a more advanced system known as the JAZZ400R. The JAZZ400R adds a SCARA robot to the output side of the FLEX Tube Pro. The robot enables things like automatic inspection of printed label data through the use of barcode scanners or vision systems and automatic loading of Trays or Racks. Starting back at the beginning, we still have our benchtop PR100 Tube Pro for those who require a highly reliable system but aren’t ready for full automation. In a nutshell we have a completely scalable solution that our customer can upgrade over the course of time. Starting with the PR100 Tube Pro benchtop solution and graduating all the way to the JAZZ400R, we have all of the possible tube/vial labeling applications covered. Nautilus Systems, Inc (NSI) is pleased to announce a new product for product identification and labeling. Multiple customers have approached NSI about the possibility of a ‘laser and apply’ system. NSI has already been providing conventional ‘print and apply’ systems which utilize thermal transfer printers to print data onto label materials. In some cases the thermal transfer printing does not provide the necessary combination of durability and readability for long-term use. In those cases some customers use lasers to mark labels with barcode and/or human readable content. The issue that our customers have previously experienced is that no ‘Laser and Apply’ systems exist. These customers currently must run label materials through a laser print station, rewind the roll of labels, and then move it to a separate applicator system to apply the labels to their products. This is a cumbersome process from a logistical and scheduling perspective and is very limiting in the type of applications that it can serve because it requires batch printing, rather than real-time printing of labels. The NSI solution provides the best of all worlds. We have taken our tried and true PL Applicator technology and integrated a CO2 laser right at the point where labels are dispensed resulting in just in time or real-time label printing. This means that each item to be labeled can have product-specific information such as date/time stamp or other data printed and applied to it. In addition NSI can integrate a vision system to inspect and verify the printed data and can even include an automatic reject station that will ensure that any rejected labels are not applied to a product but are placed back onto the label liner to be rolled up on the takeup hub. ‘Laser and Apply’ from Nautilus Systems, Inc.; there’s never been anything like this. Stay tuned! Nautilus Systems, Inc (NSI) is pleased to announce implementation of roller sets specifically for Syringe Labeling based on our standard ‘PR100 Tube Pro’ tube and vial labeling system. Our customers have spoken and made us aware that in addition to tubes and vials there are other cylindrical labware components that require highly reliable product identification and labeling systems. Amongst those other components there is strong demand for Syringe labeling. NSI has listened and found that the PR100 Tube Pro is very well suited for Syringe Labeling ‘as is’ with a requirement only to develop roller sets configured specifically for the Syringes. In addition to the roller sets, which are a simple enhancement, we have put plans in place for accessory modules that can be used to ‘clock’ syringes to ensure that the label application starts and ends in the required position radially on the Syringe. This module can be valuable for customers who want to ensure that the label does not cover pre-printed or molded graduation features of standard Syringes. Note that the same PR100 Tube Pro system can be easily setup to run Tubes, Vials, or Syringes of different types all in the same day with minimal changeover or setup requirements. We will be officially adding Syringe Labeling to our Lab Automation web pages in the near future and look forward to increased use of the PR100 Tube Pro in the lab market. In 2010 Nautilus Systems, Inc. began developing its first products for the laboratory market, the PR100i Print and Apply Labeler and the Tube Pro Accessory Module for applying and wrapping printed labels on tubes and vials. In 2012 Nautilus Systems, Inc. will be releasing new products specifically configured for bulk feeding of Tubes and Vials used in laboratory automation. Currently there are no standard solutions on the market for this purpose. Tubes and Vials must be handled manually or, best case, by implementing a vibratory feeder unit. As anyone knows who has ever encountered vibratory feeders those units are extremely expensive, very noisy to the point that either special soundproof enclosures are necessary or all nearby personnel must wear hearing protection, and extremely inflexible as they are configured specific to one and only one tube or vial geometry. Enter Nautilus Systems, Inc.’s new “Flex Feeder T&V”. The Flex Feeder T&V will allow our customer to load a hopper with a large quantity of Tubes or Vials. Once loaded the Flex Feeder will automatically separate individual Tubes or Vials from the bulk storage hopper and feed them out, end to end, on an included conveyor system. The Flex Feeder will include an ‘autosort’ function that will examine each Tube as it is individually separated and orientate it so that all Tubes exit the conveyor in the same orientation. This means that if the capped side of the Tube or Vial must be ‘leading’ as it travels the conveyor the autosort will ensure that it is cap leading. Once the Tubes or Vials have been placed on the conveyor and are feeding end to end an auxiliary system can be used to automatically load them into a Tray in whatever configuration is required. Imagine doing away with the expensive and time consuming effort in simply loading Tubes into Trays so that they can later be placed into Instruments where the important work begins! Initially the Flex Feeder T&V will be released to work in conjunction with our PR100 Tube Pro system but will shortly thereafter be released to operate as a standalone unit to be connected to other automated systems including a Tray Loading Device that will be released by Nautilus Systems, Inc. The system is a ‘Flex’ Feeder because it can be quickly changed over to run different types of Tubes and Vials up to nearly 4″ in length. All that is required is to remove one tooling plate and replace it with another and then modify a few settings through the included interface and the Flex Feeder T&V will be up and running on the new Tube or Vial. Typical Tubes and Vials that the system is designed to feed include Nunc, Nalgene, and other similar Tube, Vials, and Cryo Vials. Stay tuned to nautilussys.com for further information. This product will be released in early Summer 2012! In a recent opportunity a customer approached Nautilus Systems with a particularly challenging application. The application involves placement of two-sided die-cut adhesive onto a plastic housing. The adhesive components are roughly 4 x 25mm in size and with complex geometretic features including windows without adhesive as small as 1 x 3mm. The customer selected NSI’s PL100EPr for the application after due diligence and research efforts in which NSI was able to prove that our technology could accomplish this task like no other. The application requires the PL100EPr to feed and present the Adhesive to a robotic actuator. The robotic actuator incorporates a camera system and a sophisticated end of arm/gripper tool. The robot uses its camera and gripper to pick up a plastic Housing. It then transfers the plastic Housing to a position directly above the Adhesive component that is exposed on the PL100EPr peel bar. The robot uses its camera again to confirm the exact position of the Adhesive component and then calculates the exact position to which it must move the gripper to align the Plastic Housing perfectly to the Adhesive Component. Once the robot has aligned the two items it lightly presses the plastic Housing onto the Adhesive and then triggers the PL100EPr Feeder to ‘peel’. The PL100EPr executes the peeling action which removes the liner and leaves the Adhesive attached to the plastic Housing in the robot gripper. The robot then moves to another position where it applies the Plastic/Adhesive sub-assembly to another component. At NSI we call this process ‘lamination mode’. Lamination mode has become an increasing prevalent type of application for which customers select our PL100r and PL165r Feeders as their automated solution. If you have an application that requires lamination of die-cut double-sided Adhesive components to another component please consider NSI equipment to meet your application needs. Thanks! Nautilus Systems, Inc., in our ongoing efforts to enhance our products, is pleased to announce the development of an Electric Tamp Module that will be available for all of our PL series of Applicator products. Key benefits of the Electric Tamp include flexibility in programming the motion of the tamp including rapid acceleration and deceleration, elimination of pneumatic cylinders and associated sensors, and overall reduced air consumption. The Electric Tamp will be an optional module available for PL100i and PL165i Applicators. The Electric Tamp will be as fast, or faster, than the pneumatic tamp but with the ability to provide highly controlled motion. One special option this module will provide is a ‘push’ move. The push move allows the Tamp to place a Label or Die-Cut Adhesive Component onto a substrate and then press it until meeting a set force threshold. The end result is no more ‘banging’ that occurs when pneumatic tamps hit the target or substrate and the ability to provide specific force of application. This product is in development at the time of the writing of this post and will be available as a product in the coming months. Stay tuned for further info and thanks again for your interest in Nautilus Systems, Inc. Applicator products.